JD’s 2017 “6.18” anniversary sales event set a new record, recording $17.6B in transaction volume* for the first 18 days of the sale (June 1-18). Transaction volume increased well over 50% compared to the first 18 days of last year’s 6.18 event. JD’s June 18 anniversary sale has become a massive mid-year consumer event in China. As its recognition in the market has grown, it has become a major event that drives new users to our site and helps participating brands build name recognition and loyalty. In particular, this year we saw categories that are traditionally bought by women gain strong traction, including fashion, luxury products and maternal products. The number of female first-time customers on JD during this year’s event was nearly double the number of new female customers during the same period last year. We spread our major sales over a number of days in order to relieve pressure points to make it the best possible customer experience. By offering discounts for different categories over a period of days, with all categories on sale on June 18, consumers can make their purchases in a more relaxed manner. 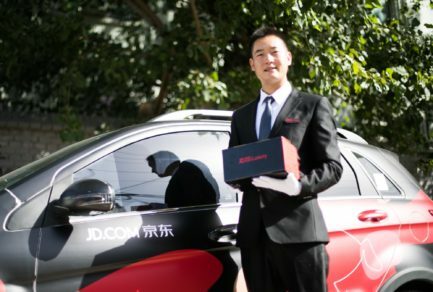 Meanwhile, by releasing some of the pent up demand in the days ahead of June 18, JD can help ensure that its famed same- and next-day nationwide delivery network can continue to meet consumer expectations, rather than causing the massive delays that have plagued major sales elsewhere in the industry. As JD’s anniversary sale has turned into a national phenomenon, we have been surprised and flattered to see so many of our industry peers celebrating our 13th anniversary this year through their own sales activities.